Bodacious Biscuit Love: Are We Going To Share Our Peanut Butter Biscuit Recipe? Are We Going To Share Our Peanut Butter Biscuit Recipe? Not too long ago we let everyone know that we'd be sharing the recipes of our old flavors. We're also eliminating the current "dog treat recipes" tab. The replacement will be a page filled with our very own homemade dog treat recipes. The goal is to create a new recipe every week. Down the road, maybe two. Since making that announcement, a lot of people have asked, "Will you be sharing the recipe for the biscuits you offer to the public?" At first, I didn't know what to say. I hadn't really thought about it. I'm not going to lie. When I did start thinking about it, I leaned more towards no. We've been offering and donating these biscuits for almost 3 years now. It's the only biscuit we offer to the public. Would it be that horrible to keep this one to ourselves? One of the many inspirations behind creating our own dog treat recipes is to inspire and encourage others. 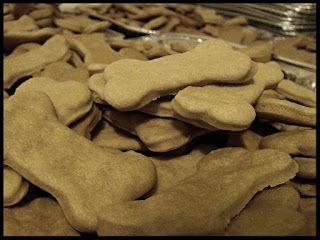 A lot of people assume that making dog treats is a long and tedious process. It's not. If you can make a batch of "hooman" cookies, you can make dog biscuits. Simple. Easy. Inexpensive. No preservatives, fillers or dyes. And, if your the parent of "hooman" kids, it's a fun project to do with them. I thought about it a little more. I've lost count how many people have given us positive feedback about our biscuits. Some have said, "I try to make a bag last as long as it can. If I could afford to buy 4-5 bags a week, I would." Every week, in addition to spreading biscuit love to our local animal shelters, we give bags o' biscuits to people who have rescue pups, have adopted from shelters and those who aren't always able to afford dog treats. Some pups prefer a plain ol' treat. Our peanut butter dog treats have only 4 ingredients. For picky pups, the least amount of ingredients, the better. After quite a bit of mental deliberation, I couldn't help but think, "Yes." If we include our peanut butter dog treat recipe, people can make 'em at home, fill the treat jars and never have to worry about running out. You probably already have the ingredients on hand. That will be the first recipe we offer. The new tab will be going up soon. Right now we're working on typing out the recipes and uploading photos.